Syllabus of the Online Course (Subject) - G5 Sahel: Burkina Faso, Chad, Mali, Mauritania and Niger. Introduction to the G5 Sahel: Burkina Faso, Chad, Mali, Mauritania and Niger (África). Threat of jihadist terrorism in the Sahel (Al-Qaeda in Islamic Maghreb, Movement for the Unity of Jihad in West Africa (MUJAO) - Al Mourabitoune, Boko Haram). Learning materials in or G5 Sahel G5 Sahel G5 Sahel. 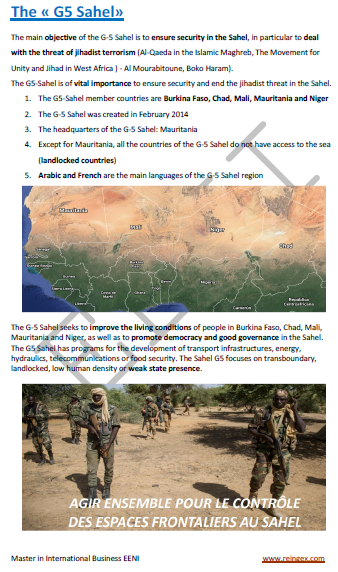 The main objective of the G-5 Sahel is to ensure security in the Sahel, in particular to deal with the threat of jihadist terrorism (Al-Qaeda in the Islamic Maghreb, Movement for Unity and Jihad in West Africa ) - Al Mourabitoune, Boko Haram). The G5-Sahel is of vital importance to ensure security and end the jihadist threat in the Sahel. The G-5 Sahel seeks to improve living conditions of people in Burkina Faso, Chad, Mali, Mauritania and Niger, as well as to promote democracy and good governance in the Sahel. The G5 Sahel has programs for transport infrastructures development, energy, hydraulics, telecommunications or food security. The Sahel G5 focuses on transboundary, landlocked, low human density or weak state presence.